After you have searched and filtered your bathymetry data in the Explore Bathymetry window, you can use it to create a surface model using the Compose Surface window. The Compose Surface window allows you to sort and order the datasets displayed based on collection, extended, and internal metadata fields. If you need to ensure you are always showing your highest resolution or most recently acquired datasets without any concern about whether they will be obscured by less significant datasets, you can change their display order using the Compose Surface window. For example, if you have 10 raster datasets managed within your Bathymetry Information System (BIS) geodatabase and three are 1 meter in resolution, and the rest are 5 meters in resolution, you can configure a display rule that places the 1-meter datasets on top of the 5-meter datasets when all 10 are displayed. In this case, if any of the seven 5-meter datasets overlap any of the 1-meter datasets, the denser, or perhaps higher-resolution datasets would be displayed on top of the lower-resolution datasets. This approach gives you the ability to specify the display order for your bathymetry data. When your data is organized the way you want, you can generate a preview of the organized datasets and display them as a mosaic dataset in the data view in ArcMap. From there, you can adjust the color ramp, perform surface analysis with the geoprocessing framework, or display it with other applicable data layers. Click Customize > Toolbars > Bathymetry on the main menu to activate the Bathymetry toolbar if necessary. Click the Compose Surface button on the Bathymetry toolbar. The Compose Surface window appears. Click the Add Datasets From Explore Bathymetry Window button located at the top of the Compose Surface window. The filtered bathymetry datasets are added to the Filtered Datasets list on the Compose Surface window. Files are displayed in the order they appear in the Filtered Datasets list with the top most file being displayed on top of all other files in the generated preview. For datasets to be added to the Compose Surface window, they must share the same properties for Dataset Type, Vertical Units, and Direction. Select a dataset from the list. Right-click the dataset and optionally click Remove From List button to remove the selected dataset from the surface model. You can select multiple items to remove using the Shift and Ctrl keys. 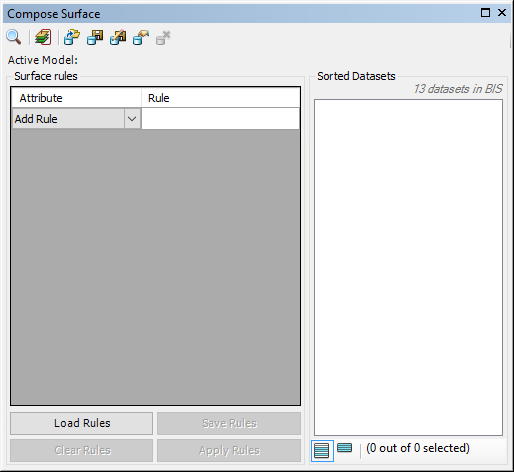 Click the Add Rule drop-down arrow at the top of the Surface rules section to use a rule to automatically adjust the dataset display order. Choose the metadata attributes you want to use to sort the datasets. This can be any numeric, date, or enumerated attribute field contained within your Collection, Extended, or Internal metadata. String fields cannot be used. Metadata attributes appear in the Rule cell next to your new rule. Click the Rule cell next to the Attribute drop-down list. The Priority dialog box appears. 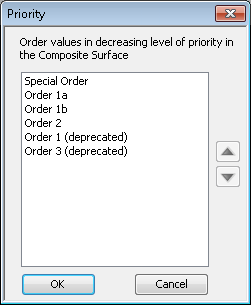 You can change the order of the values for each rule in decreasing level of priority on the Priority dialog box. Numeric and date fields can be prioritized using the Maximum and Minimum values, whereas enumerated fields can be prioritized using the custom metadata values specific to that field. Select a value and use the up and down arrows to adjust the priority level. For date fields, the priority can be set from oldest to newest date (Minimum to Maximum) or newest to oldest date (Maximum to Minimum). For numeric fields, the priority can be set to ascending order (Minimum to Maximum) or descending order (Maximum to Minimum). For enumerated fields, you can customize the priority using any of the metadata values specific to that field. Click OK to see the new dataset order. Repeat steps 7 through 11 to add additional sorting rules. You can remove all the rules you have configured by clicking Clear Rules. If you have loaded a rule file in the Compose Surface window and click Clear Rules, the rule file will not be modified unless you click Save Rules. When you are done adding sorting rules, you can manually change the display order of the datasets by clicking a dataset in the Sorted Datasets list and dragging it up or down in the list. To move a dataset or a group of selected datasets to the top or bottom of the list, right click the dataset or datasets and click the Move To Top or Move Selected to Top button or the Move to Bottom or Move Selected to Bottom button . Optionally click Apply Rules to reset the manual sort order in the Sorted Datasets list to the sorting rules order. Whenever the display order is manually changed in the Sorted Datasets list, the Apply Rules button becomes enabled. If the up and down arrows at the bottom of the list have not been used, the Apply Rules button will remain disabled. Click the Preview button to generate a preview of the ordered surface. A mosaic dataset containing all sorting and display rules is added to the table of contents in ArcMap. The mosaic dataset generated by the Preview tool has approximate values calculated for the Min, Max, Mean, and Standard Deviation raster statistics fields. If you need to generate precise statistics, use the Calculate Statistics geoprocessing tool.